Geof put out the word that he wanted to do some hill training to prepare for his Texas Rando Stampede 1200K ride, so I suggested the classic Triple Hump in Stokes County. I modified the route a bit, but kept the 3 major climbs: Sauratown Mountain, Pilot Mountain, and Hanging Rock. I've never attempted any serious climbs like this, so I was nervous. Would I even be able to do it? I couldn't get to sleep Saturday night, my mind wouldn't stop fretting about the next day's climbing- not to mention the descending! One of the things people forget about riding mountains is that sure, the climbing is hard but the descending is more dangerous. I'd had about 2.5 hours of sleep when we left Cary early Sunday morning to meet David in the parking lot on top of Hanging Rock at about 9am. 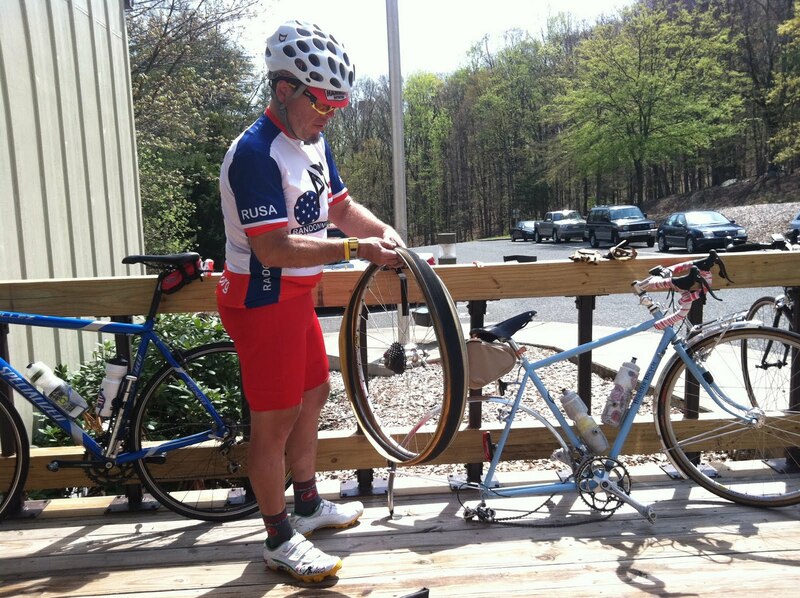 I brought the Specialized Allez instead of the LeMond rando bike- perhaps saving a pound and a half would make the difference between survival and utter failure. Geof brought Claire, his newly built custom randonneuse, and David was riding his Soma Stanyan. It was chilly and foggy atop Hanging rock as we prepared to set off. I put on arm warmers, but elected to leave behind the jacket and knee warmers since I wasn't running a bike with bags to stash the layers once peeled. The forecast was for mid to high 70 degree highs later in the day. The ride starts with a screaming descent of Hanging Rock and it was COLD. Pretty sure all three of us were experiencing some shiver-induced speed wobble! Once down the mountain it was still cold and foggy, but at least we were traveling at a more reasonable rate of speed. A short ways down Moore Springs Rd. we passed a convenience store and noted their sign that advertised Hammer Nutrition products- made a mental note to stop on the way back before the final climb of the day. 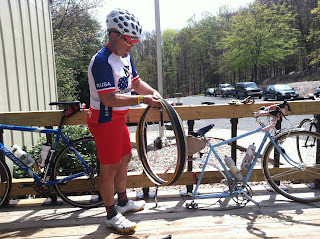 The ride over to Sauratown Mountain was chock full of "rollers." Of course, back here at home they would be classified as big hills! The climbing served to warm us up a bit, but inevitably we'd crest the hill and go speeding down the other side again. Before we knew it we were at Sauratown Mountain, which on paper looked worse than it turned out to be. MapMyRide had it as a 5 mile climb with an average 4% grade, but that was taking into account the 2 miles leading up to the turn onto Sauratown Mtn Rd, so when we thought we were starting we only had 3 miles left to the top! Also this road is mostly straight, with only 2 big turns so it's easier to maintain a climbing rhythm. I kept Geof in sight for quite awhile, and in this fog that meant that he was probably within 50 or 100 feet of me! Eventually he gained enough of a gap that I lost sight of him, but when I suddenly broke out of the fog into bright sunlight near the summit I could see him just ahead. At the top he had maybe 2 or 3 minutes on me. David was just behind us. Climbing and sunshine had warmed us up so the layer peeling commenced, and everybody had a snack before we set off for the day's second screaming descent. When we re-entered the fog on the way down Sauratown the temperature dropped drastically. I was wishing I still had my warmers on. My companions disappeared into the mist as my shivering caused me to have to slow down to avoid the wobbles. Thank goodness the organizers of the Three Mountain Madness had spray painted "SLOW" on the road just before the big curve because in this thick fog we couldn't see that far ahead! As I came around the curve I spotted Geof & David on the side of the road and I worried that something bad might have happened. 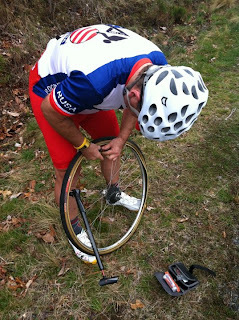 It was hard to stop on such a steep slope, but when I got to them I discovered that it was just that Geof had flatted his rear tire. Turns out it was a cheap tube, and the heat from heavy braking caused a leak. He patched it while I held Claire so she wouldn't get too dirty and we continued on our way. The first serious climb was behind us and I was very happy with my performance. I'd read about climbing and descending techniques, so I was just trying to find my rhythm and keep my heart rate from getting too high. It worked. Now we were on our way to climb Pilot Mountain. I've driven that road before- it's the quintessential mountain road with steep twists and turns and switchbacks. The kind of road that you drive up in 2nd gear and overheat your brakes on the way down. 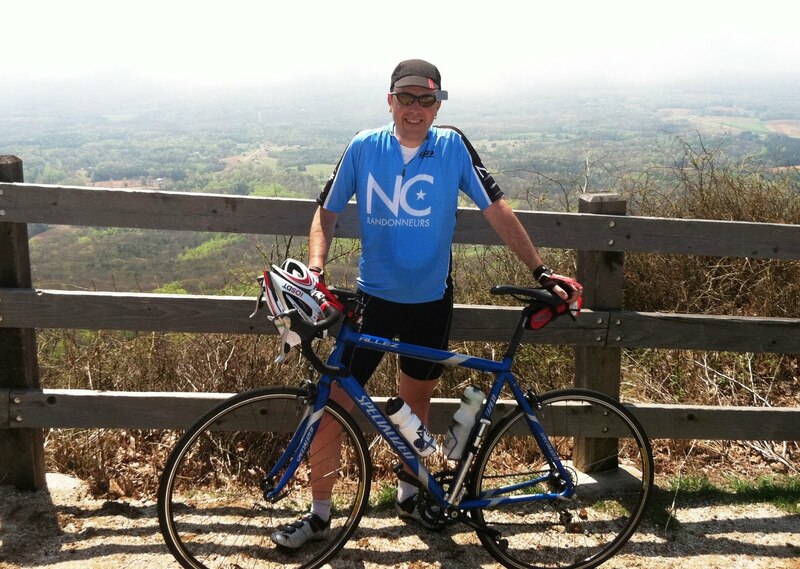 MapMyRide has it as a class 2 climb: 3 miles at an average 7.1% grade, and in that 3 miles you climb 1,100 feet! 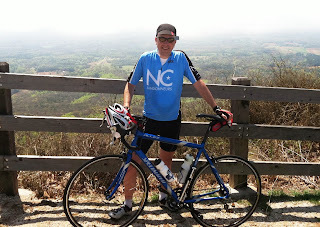 I've ridden centuries with less elevation gain than we were about to do in just a few miles. At the top & still smilin'! We took pictures and posted status updates to Facebook from the top of the mountain and then started the descent. I went first, and on the very first turn I misjudged how tight the switchback was and "overcooked it" a bit, crossing the double-yellow and raising the pucker factor drastically. I think I was a bit timid on the next few turns because Geof and David were close behind me, so I got braver and started taking the turns with more gusto and built up a little lead on Geof. I didn't want to force him to brake too much and have the same overheating problems he had on Sauratown. Soon I could no longer see my companions in my mirror, and I was really getting the hang of this descending thing. When I reached the visitor center at the bottom I stopped for water and hoped Geof and David would see my bike parked there. Once my bottle was full they still hadn't arrived and I started to worry. When a minivan stopped on the way down to tell me that one of them was on the side of the road up there with a wheel off I was pretty sure Geof had flatted again. I waited a bit, but finally decided to ride back up to them so I could come back down again! Sure enough, everybody was fine but Geof's patch job couldn't take the heat from the braking and Claire had gone flat again. Now that Claire could hold air again we got back on the road and hit a store in Pinnacle for liquids and snacks, then headed back along the rollers toward Hanging Rock. We were treated to fantastic views of Pilot and Sauratown Mountains and some really fun roads. Just before Hanging Rock we stopped at the convenience store and sampled their Hammer Nutrition products. Location, Location, Location! One quick right hand turn and we were back to climbing. This time Geof had a lead, so I was just happy to keep him in sight. There'd be no way to catch him since he would just speed up if he saw me coming. At first I tried to close the gap a bit, but it was definitely better to just find my own rhythm and get it done. 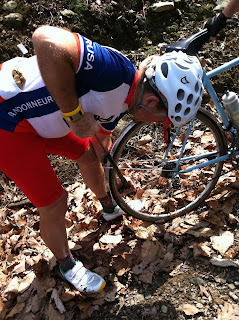 There's no way to catch Geof on an uphill if he still has air in his tires. At the top I wasn't too far behind, I still had him in sight when he turned into the parking lot. All in all I had a great day on the bike and found out that I can actually do this climbing stuff! Also, I cannot believe that you skipped Mickey Rd! Wimps. Our route didn't exactly turn out as planned. After all the time watching G patching tubes we ended up just heading straight back to Hanging Rock following the brown signs!